Photo shows the gap between train and platform for the KLIA Transit which the writer has to go across every time he boards and disembarks at KL Sentral. THE fear that has been gripping me for the past three months has finally come true. I fell off the wheelchair as I was being assisted into the KLIA Transit train at Stesen Sentral Kuala Lumpur on Thursday. The KLIA Transit is the most convenient mode of transport for me to go to Kuala Lumpur International Airport. I go there to conduct workshops on disability from Mondays to Thursdays every week. The most convenient turned out to be a dangerous one as well. 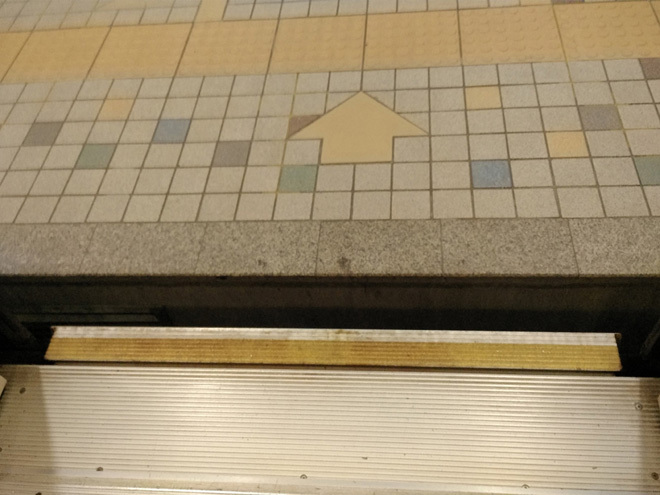 There is a six-inch gap between the train and platform. Other than the gap there are two small kerbs at the entrance of the train that could snag the front casters of my wheelchair. A security personnel member or porter would usually assist me to board or disembark. To cross over, they will have to pop a wheelie and push the wheelchair to cross the gap and avoid the two small kerbs. None of the staff assigned to assist me were trained to handle wheelchairs safely. Many times, they failed to listen to instructions. If the wheelie is not done properly, it could cause the front casters to drop into the gap or hit the kerbs. This has happened several times. The sudden stoppage of the wheelchair has caused me to lose balance. If not for the quick reaction of the other passengers in grabbing me, I would have fallen. I complained to the CEO of Express Rail Link Sdn Bhd (ERL) Noormah Mohd Noor the first time it happened in January. I wrote to her a second time four days later after the casters fell into the gap again. I also copied the emails to the Ministry of Women, Family and Community Development and Land Public Transport Commission. One of the officers from ERL replied eight days later. I have also met the officer and communicated with him via WhatsApp to arrange for a meeting to discuss the problems I have been facing and training their staff on safe and proper wheelchair handling. I never heard from him since. In the meantime, I made it a point to lodge a report with the duty manager each time the casters got wedged in the gap or hit the kerbs. No concrete actions were taken except offers of apologies and that they would look into my complaints. And on Thursday, I fell. The casters hit a kerb at the entrance. I was thrown off the wheelchair and flopped onto the floor. The severity of my impairment meant that I could not break my fall to avoid serious injuries. As I lay there on the floor, I wondered if any of my bones were broken. It took three persons with great effort to get me back onto the wheelchair. I was not sure if I was injured, except for an aching knee, as I have very little sensation from my chest down. I continued on my journey to KLIA because there was no one to replace me on short notice. As I sat there collecting my thoughts, I cried. I did not cry even when the doctor told me I have end stage renal failure. I did not cry when I was told I have to go on dialysis for the rest of my life. But I cried that morning. I cried because life was such a struggle every day when taking the train. That fall broke my self-confidence. That fall broke my spirit. That fall broke my courage to live life as independently as possible. That fall broke the dam that was holding back all my fears. After three months of putting on a brave front, I finally broke. I have osteoporosis. I could have fractured a hand or an arm. As impaired as they may be, I still depend on them for all my tasks, including my mobility. A broken limb would have robbed me of whatever independence I have left. Or I could have hit my head against the floor or fractured my spine again. I could have died in that fall. I shared the incident on Facebook. Suddenly, I got messages from the top management of ERL wanting to talk or meet me on the same day. That was after two months of deadly silence and inaction. The CEO sent a representative to meet me but that did nothing to wash away the fear and danger I had endured for the past three months. This apathy and complacency to safety issues is prevalent in Malaysia. Complaints are repeatedly ignored until something major happens or it goes viral on social media. Then they scramble to do damage control to repair the negative publicity rather than out of genuine concern. These are human lives we are talking about but they are often taken lightly or not at all. Later that evening, my wife did a visual examination of my body. The only visible injury was a large bruise on my left hip. Both knees ached. However, there was no apparent swelling. I hope there are no internal injuries that could take a longer time to manifest. The physical injuries will heal in time, I guess. But my self-confidence in my ability to move about freely and safely will take a longer time to recover. The fear of falling is overwhelming. Every small barrier that never posed any problem previously looks like an abyss now. Photo shows one of the writer’s injuries from the fall.